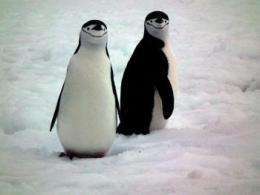 A pair of chinstrap penguins in Antarctica. New research suggests that, if carbon dioxide emissions continue on their current trajectory, Earth may return to a climate of tens of millions of years ago when the Antarctic ice sheet did not exist. ©UCAR, Photo by Andrew Watt. (PhysOrg.com) -- The magnitude of climate change during Earth's deep past suggests that future temperatures may eventually rise far more than projected if society continues its pace of emitting greenhouse gases, a new analysis concludes. The study, by National Center for Atmospheric Research (NCAR) scientist Jeffrey Kiehl, will appear as a "Perspectives" piece in this week's issue of the journal Science. Building on recent research, the study examines the relationship between global temperatures and high levels of carbon dioxide in the atmosphere tens of millions of years ago. It warns that, if carbon dioxide emissions continue at their current rate through the end of this century, atmospheric concentrations of the greenhouse gas will reach levels that existed about 30 million to 100 million years ago, when global temperatures averaged about 29 degrees Fahrenheit (16 degrees Celsius) above pre-industrial levels. Kiehl said that global temperatures may gradually rise over centuries or millennia in response to the carbon dioxide. The elevated levels of carbon dioxide may remain in the atmosphere for tens of thousands of years, according to recent computer model studies of geochemical processes that the study cites. The study also indicates that the planet's climate system, over long periods of times, may be at least twice as sensitive to carbon dioxide than currently projected by computer models, which have generally focused on shorter-term warming trends. This is largely because even sophisticated computer models have not yet been able to incorporate critical processes, such as the loss of ice sheets, that take place over centuries or millennia and amplify the initial warming effects of carbon dioxide. "If we don't start seriously working toward a reduction of carbon emissions, we are putting our planet on a trajectory that the human species has never experienced," says Kiehl, a climate scientist who specializes in studying global climate in Earth's geologic past. "We will have committed human civilization to living in a different world for multiple generations." The Perspectives article pulls together several recent studies that look at various aspects of the climate system, while adding a mathematical approach by Kiehl to estimate average global temperatures in the distant past. Its analysis of the climate system's response to elevated levels of carbon dioxide is supported by previous studies that Kiehl cites. The work was funded by the National Science Foundation, NCAR's sponsor. Kiehl focused on a fundamental question: when was the last time Earth's atmosphere contained as much carbon dioxide as it may by the end of this century? Since carbon dioxide is a greenhouse gas that traps heat in Earth's atmosphere, it is critical for regulating Earth's climate. Without carbon dioxide, the planet would freeze over. But as atmospheric levels of the gas rise, which has happened at times in the geologic past, global temperatures increase dramatically and additional greenhouse gases, such as water vapor and methane, enter the atmosphere through processes related to evaporation and thawing. This leads to further heating. At that time, temperatures worldwide were substantially warmer than at present, especially in polar regionseven though the Sun's energy output was slightly weaker. The high levels of carbon dioxide in the ancient atmosphere kept the tropics at about 9-18 degrees F (5-10 degrees C) above present-day temperatures. The polar regions were some 27-36 degrees F (15-20 degrees C) above present-day temperatures. Kiehl applied mathematical formulas to calculate that Earth's average annual temperature 30 to 40 million years ago was about 88 degrees F (31 degrees C)substantially higher than the pre-industrial average temperature of about 59 degrees F (15 degrees C). The study also found that carbon dioxide may have at least twice the effect on global temperatures than currently projected by computer models of global climate. The world's leading computer models generally project that a doubling of carbon dioxide in the atmosphere would have a heating impact in the range of 0.5 to 1.0 degree C watts per square meter. (The unit is a measure of the sensitivity of Earth's climate to changes in greenhouse gases.) However, the published data show that the comparable impact of carbon dioxide 35 million years ago amounted to about 2 degrees C watts per square meter. Computer models successfully capture the short-term effects of increasing carbon dioxide in the atmosphere. But the record from Earth's geologic past also encompasses longer-term effects, which accounts for the discrepency in findings. The eventual melting of ice sheets, for example, leads to additional heating because exposed dark surfaces of land or water absorb more heat than ice sheets. "This analysis shows that on longer time scales our planet may be much more sensitive to greenhouse gases than we thought," Kiehl says. Climate scientists are currently adding more sophisticated depictions of ice sheets and other factors to computer models. As these improvements come on line, Kiehl believes that the computer models and the paleoclimate record will be in closer agreement, showing that the impacts of carbon dioxide on climate over time will likely be far more substantial than recent research has indicated. Because carbon dioxide is being pumped into the atmosphere at a rate that has never been experienced, Kiehl could not estimate how long it would take for the planet to fully heat up. However, a rapid warm-up would make it especially difficult for societies and ecosystems to adapt, he says. If emissions continue on their current trajectory, "the human species and global ecosystems will be placed in a climate state never before experienced in human history," the paper states. Let's all go back to the dark ages, where we'd all die anyway due to plague and famine. That will make both the greens and the reds very happy, as it will suit their agenda for world population decrease very nicely. We should start by making automobiles and tractors illegal. You know what? Let's go ahead and ban all Internal Combustion Engines, jet engines, refrigerators, air conditioners, and rockets too while we're at it. Any nassssssty technology that makes food and medicine possible in the modern world should be banned to facilitate the decrease in population. Well, anyone else buying what they're selling? Because whether they admit it or not, that's what they want for humanity. And "they" includes half of the people on this site. Did warming cause high CO2, or did high CO2 cause warming. Since the effect of CO2 diminishes, it's impossible for CO2 to increase global temperatures by 16 degrees C.
If the effect was that large, summer melting in the arctic would never reverse in winter. Let's all go with the straw man down to Hyperboleville. No, that's not hyperbole. That's exactly what they want. I've even debated regulars on this board who want world pop down to 1 billion or less, and pretty much want us all in the stone age. 1) I don't see how we can come close to putting 900 ppm of CO2 in the air. The reason has to do with peak oil which we are expected to reach in a few years. Since we started burning oil and natural gas, we've pushed CO2 levels from about 275 ppm to 390 ppm, a delta of 115 ppm. A quick and dirty estimate says that we will put that much more in the atmosphere (reaching ~515ppm) as we slowly use less oil as we pass over the peak oil bell curve peak and use up the rest of the oil. 2) There's a PNAS paper of CO2 levels over the last 500 million years of the earth and it shows that when Co2 levels were high, temps were low and when Co2 levels were low, temps were high. Having the population reduced to one-billion would be fantastic. Having some disaster or decline in the standard of living isn't the ideal way to achieve this achieve that number. I don't hear too many advocating population control via disease and famine. I don't believe the majority of environmentalists' stance is to "send us back to the dark ages"; if someone on this site "pretty much" argued that we should return to stone tools, he/she is just a total nutjob, and not representative of the whole. It is hyperbole to state that environmentalists, as a whole, want to abolish all technology. 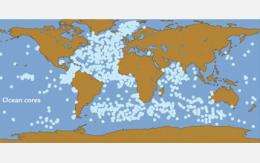 What is PhysOrg.com's carbon footprint? Between using servers to host and encouraging people to spend more time online, how many years of pre-thermocalypse existance are they stealing from our children? Why is this website murdering the planet? For shame. And why don't the rest of you slaves to consumerism and materialism just log off and go plant a tree in the potholes of your street. For shame again. I don't see how we can come close to putting 900 ppm of CO2 in the air. The reason has to do with peak oil which we are expected to reach in a few years. Since we started burning oil and natural gas, we've pushed CO2 levels from about 275 ppm to 390 ppm, a delta of 115 ppm. A quick and dirty estimate says that we will put that much more in the atmosphere (reaching ~515ppm) as we slowly use less oil as we pass over the peak oil bell curve peak and use up the rest of the oil. From another Physorg article; a couple of us where talking if the environment had hit the tipping point since projections to year 3000 showed no stopping global temperatures rise if we just stopped completely stopped CO2 at 400ppm levels. CO2 lingers for a long time; so even peak-oil won't stop the global temperature rise. If you have never seen the movie "Soylent Green" rent it; It's a classic. Great article. I like the penguins too. Thing is, the world's other reserves of fossil carbon exceed the remaining quantity of oil by orders of magnitude. Coal, peat, and natural gas, if fully exploited world-wide over the next century, will more than catapult us over the 1000 ppm mark. There's a PNAS paper of CO2 levels over the last 500 million years of the earth and it shows that when Co2 levels were high, temps were low and when Co2 levels were low, temps were high. If the MET/ IPCC can't even predict the next year's cold snap using their own computer models, why would I then think they could predict 100 years into the future. Where's some real experiments, stop relying on models, show us your source code and equations. Logic dictates I'd listen to the guy that can predict the weather and climate trends through a good track record... Piers Corbyn who states that CO2 is not a driving factor of climate change. So those that down-ranked me for this comment disagree that it was caused by a natural cycle? I'd be willing to entertain any alternate theories. If the MET/ IPCC can't even predict the next year's cold snap using their own computer models, why would I then think they could predict 100 years into the future. Do me a favor and measure the width of this human hair with this yardstick. Let me know how that comes out. The whole, "send us back to the dark ages" comment came from the Murdoch News Corp publications and has been repushed, and repushed by them under the guise of "Environmentalists say..." which is more Murdoch interference in the news media and reality. Read the research, not the abstracts, and not the journalism. If someone makes an outrageous claim, follow the source. 99% of the time it wasn't there. But leftist politics of freebies for everybody, combined with increasing life-spans, and more sophisticated (and expensive) health care options for geezers, has made reducing population in and of itself fiscally catastrophic. The only way to sustain Ponzi schemes like Social Security and defined-benefit pension plans is for there to be an ever increasing population base of younger workers to support an increasingly older senior cohort. Simple demographics. That's why killing those 75 million lumps of tissue since 1972 for convenience wasn't necessarily a good idea. The only solution will eventually be a catastrophic pruning of the older population at some point via war, pestilence or worse. Soylent green, here we come. Which is the only way your average American Joe will live decently when they retire. SS is not for the Americans can support themselves in retirement. It's not for the wealthy that have prospered on the backs of American Labor. I say, those that have prospered through the American system should recognize that the have an obligation to that American system and support a standard of live we can all be proud of. Which is the only way your average American Joe will live decently when they retire. As usual, a financially ignorant comment by a leftist. Nearly forty years ago, at the start of my career, when the max annual SS contribution was $1,500 plus an employer match, I calculated that if I had that money to put in an ordinary savings account at a nominal rate of interest, I'd have over a million dollars now to retire on. Since I would have owned that money, if I died early, I could pass the rest on to my kids. Instead, I now have the "right" vested in me by leftists to a paltry annual pension that I do not own. When I die, that's it, the government gets the rest. But what difference does that make, they've already pissed away the entire phony "lock-box" decades ago buying more votes. The "average Joe" you claim to be so concerned about has not put anything away because his ability to save has been taxed away for the Ponzi scheme. More dependence, fostered by the leftists. Social Security is based on the EXACT same financial principle chain letters are...and the Post Office has made those illegal. You guys went for it,get over it,get a life,theres no such thing as greenhouse gases destroying the earth or warming the magma either. So when can I buy options on beachfront property in Antarctica? Technically, natural gas is not a fossil fuel. Some of it is old but 'natural gas' is emitted by life all the time. It is true that land configuration was a 'tad different' over that timespan, which is precisely why this is a three-edged sword. What makes people think that past climate can be used to predict future climate with differences in land configuration not properly taken into account? For example, consider the warming/cooling oscillation that occurred because of the changes of sea levels around the Bering Strait. That oscillation stopped many thousands of years ago. I think we need to collect more data and take more into consideration while refining the models further to account for such things. The term "fossil fuel" needs to be seriously reconsidered. Is methane on Titan a "fossil fuel". Nonsense. I don't doubt some of the oil and coal we use is a result of "fossils", but all? We will innovate around the peak oil premise. Leave it alone, it is neither that simple, nor convincing. Somebody listen to right wing talking points much Jokester? Prior to the December tax cut, Social Security would have paid out every dime promised for the next 29 years. Based on your comment above, that would put you to about 85 years old. With the cut your down to getting paid till your 82. Social Security needs the upper limit of taxable earnings raised. That's it. Then it works for much longer. Unless, of course, the top 1% of the country continues to consolidate wealth and the rest of us continue to lose our shirts. Watch or read the transcript of Bernie Sanders' Nov 30, 2010 speech. Somebody listen to right wing talking points much Jokester? Prior to the December tax cut, Social Security would have paid out every dime promised for the next 29 years. There is NOTHING in the Orwellian-named "lockbox", except IOU's from ourselves, government securities, backed by nothing except the taxing and printing powers. There is NO real cash or assets in there. The cash flow deficit will bankrupt us. The entire surplus of receipts over payouts has been officially raided by both parties for over forty years to pay for budget shortfalls. Learn some history or STFU. I don't need "talking points". I'm a CPA with over 30 years of auditing and corporate financial reporting. I can assure you that if any corporation got caught doing this with its pensions, the officers would be doing hard time. There is not enough money in the top brackets in total to prevent the financial collapse about to hit us. The Progs have made sure of that. You must be smoking something. The printed dollar bills in your pocket are nothing but an IOU from the government. Are they "NOTHING" too? You may be a CPA but your grasp of economics appears to be severely lacking. MM - Did you watch Sanders' Nov 30, 2010 speech? Care to refute any of the facts he lists? I predict you won't. Just watch it. Looks like MikeyK is up to his old tricks again, impersonating posters he doesn't like. He does it by adding underscores to legitimate poster names. For example, my moniker is Skepticus_Rex. His sockpuppet is Skepticus_Rex_. Pyle, be careful you don't fall for the troll's antics like others have in the past. See my legitimate post above for what I said about natural gas technically not being a fossil fuel.